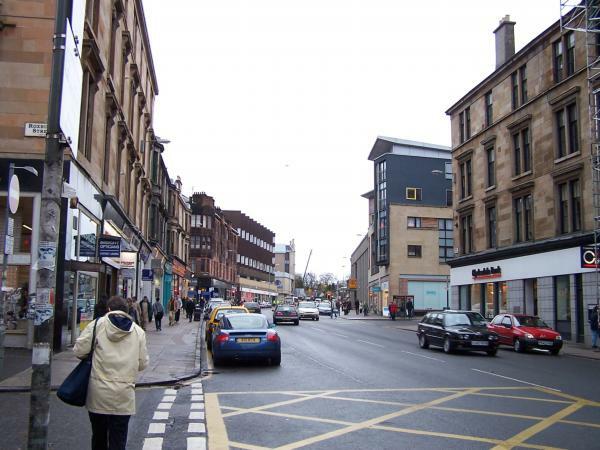 If you start from the Dumbarton Road end of Byres Road in Partick you will be met with an avalanche of restaurants on either side of the busy thoroughfare. The range of food available is in such a short stretch of the street is impressive, from local contemporary Scottish through the Mediterranean and all the way to the Far East. Each establishment serves up fine food and wines, which if you have the time, all should be visited at least once. The next section is a lot more property and hair oriented! For some unknown reason most of the street’s estate agents, mortgage lenders and barbers have set up shop here. It must be something to do with the close proximity to good food, some good bars and the ubiquitous coffee houses nearby. As you near where Highburgh Road and University Avenue meet halfway up Byres Road the estate agents thin out and clothing and footwear boutiques move in, again all offering a vast range of fashions and styles. Food still has a foothold this far up as it does for the remainder of the street, with some delicious delicatessens and sit in coffee houses. 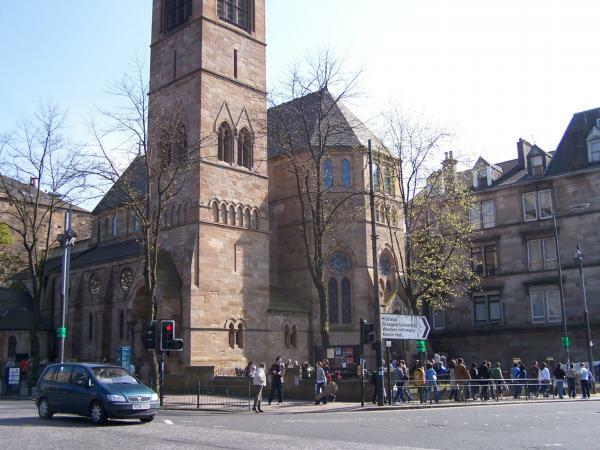 Another feature is the quantity of charity shops, many music and books shops which are the boon of the Glasgow University student population. When you reach the traffic lights at the ‘cross’ you are met with a few more eateries and some pharmacies, but the real gem of the second half of the street is the right hand side. Beyond the banks and building societies that dominate this half of Byres Road (like the estate agents and barbers before it) lie a few teaser bars, which incidentally are very relaxed and have a good range of food and beer, before the real treat of Ashton Lane. 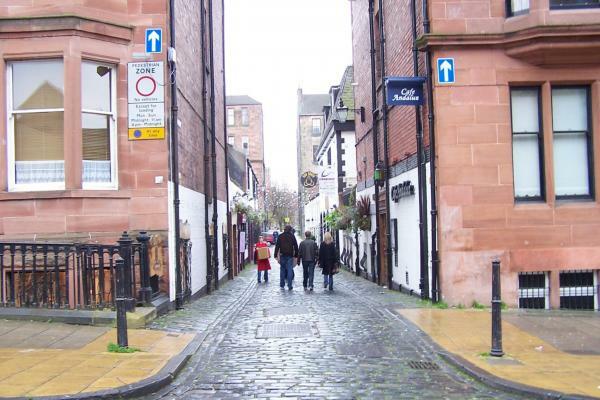 I believe it’s fair to say that Byres Road wouldn’t work without Ashton Lane and neither would Ashton Lane work without Byres Road, two truly complementary streets. 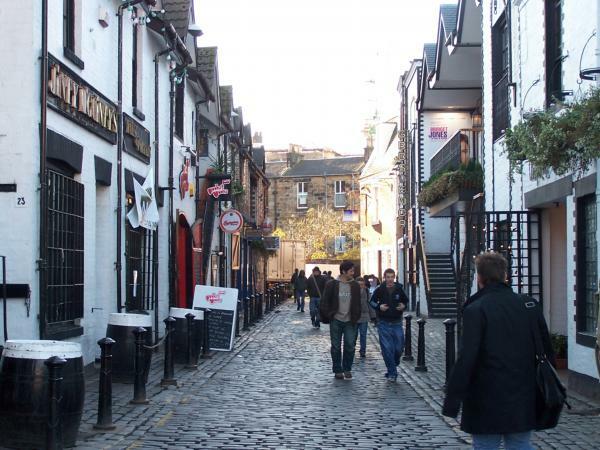 Down the narrow alley, and beyond a couple of fine bars and restaurants you have your goal, a little secluded getaway of fine dining and even finer drinking. From Ireland to Belgium, through Russia and India and back to Scotland…with a cinema topped by a sprawling bar & restaurant thrown in for good measure. And a good measure is what you get, each and every establishment squeezed into the lane makes sure you leave with a full belly and a pair of jelly legs! If you managed to leave Ashton Lane in one piece then straight across the road is Ruthven Lane, host to a few fine eateries as well as a whole range of small businesses, definitely worth a look, whether you are interested in second hand goods, want a relaxing massage or are even looking for some different styles of clothes to try... in many ways Ruthven Lane is like a concentrated Byres Road, in that you need to visit it more than once to get the real gist of it. On the main road again, you have a few cafes and coffee houses, as well as some sports and extreme sports shops, newsagents and some jewellers, also if your eyesight is failing a couple of opticians are nearby. 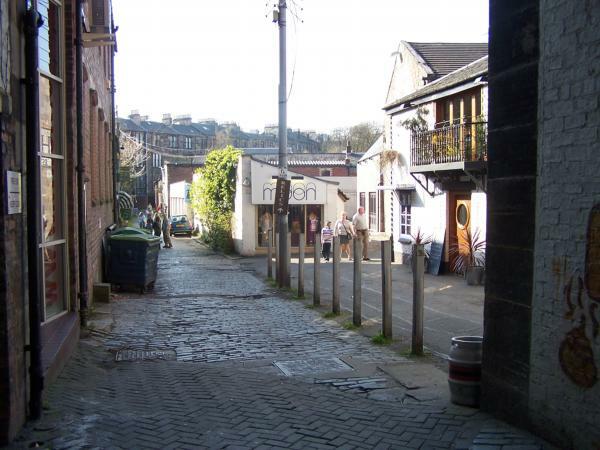 Again, another gem hides behind the main street, that of Cresswell Lane and Decourcey’s Arcade. In many ways its an explosion of mind, body, books and music! It is a true something for everyone lane, and you are bound to buy something from at least one business here, at the very least a coffee. Nearing the top of the street and the end of our stroll, you go by the local Library which always seems to have some kind of sale or event on and next to it is the streets flower salesman outside the recently re-opened Fopp record store, always a mine of useful knowledge about the street and who’s who. Only a few more steps to go, Great Western Road at the top signals the end of Byres Road with the majestic Glasgow Botanic Gardens crowning a street which has it all and never fails to disappoint. 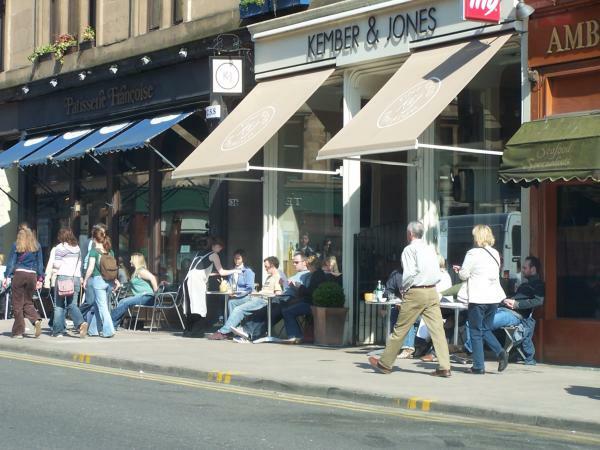 Byres Road is part of Hillhead, the steep hillock enclosed by Great Western Road, Byres Road and University Avenue. Its design is that of a ‘grid-ironed hillside’ town with an overview of the countryside. Comprising of Impressive Houses to the east, Tenements to the North and West while Classical Villas dominate the upper reaches of Gibson Street. 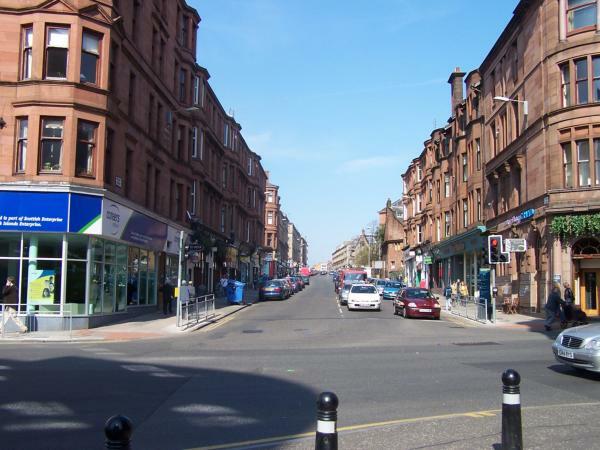 Byres Road Was formed from a small village called the Byres of Partick, occasionally called the Bishop's Byres. 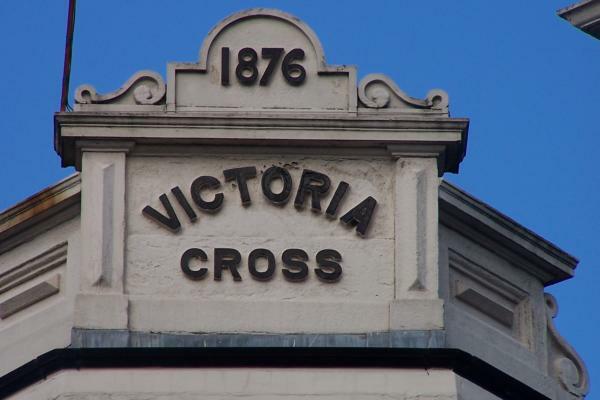 Byres Road was to be renamed to Victoria Road many years ago but obviously that was never achieved, no doubt down to the proud nature of the Road’s occupants. There is the occasional relic to be found on Byres Road, possibly a leftover from this attempt. It became the High Street of the Burgh of Hillhead in 1872 with a grand Town Hall, sadly, now demolished. The Road is flanked by tenements, many of appreciable opulence. Similarly opulent tenements stretch out on either side: Great George Street with its Red Sandstone and Dowanhill Street with its White Sandstone, the grandeur of these buildings diminishing as it nears Partick, but still no less impressive. Another notable feature of Byres Road is the clock like sculpture on the corner of the cross with University Avenue. It depicts phases of the moon, and the radiating arms originally were backlit but this has been inoperable since circa 2000, this suggests it was intended to depict a solar or lunar eclipse. © UK Search Network Limited 2019. All rights reserved.